The team who have organized the MotoAmerica race series deserve great respect for creating a positive future for moto-racing in North America following several years of decline under previous organizers. MotoAmerica became the AMA/FIM-sanctioned North American race series in 2015 (much has been written elsewhere about this transformation*). Even at the highest level of moto-racing the motivation to participate has to be love of the sport. Fame and fortune are possible only for a vanishingly small number of riders so the rewards for other riders and teams are mainly existential. To their great credit, the people who make up the MotoAmerica team are working hard, and succeeding, to create the best series for both professional and amateur racers. I have met only a few of the MotoAmerica team but was deeply impressed by their investment in the success and integrity of the series. MotoAmerica is succeeding because the team members I observed at the 2016 preseason test have deep personal connections to moto-racing. Most have themselves been racers. 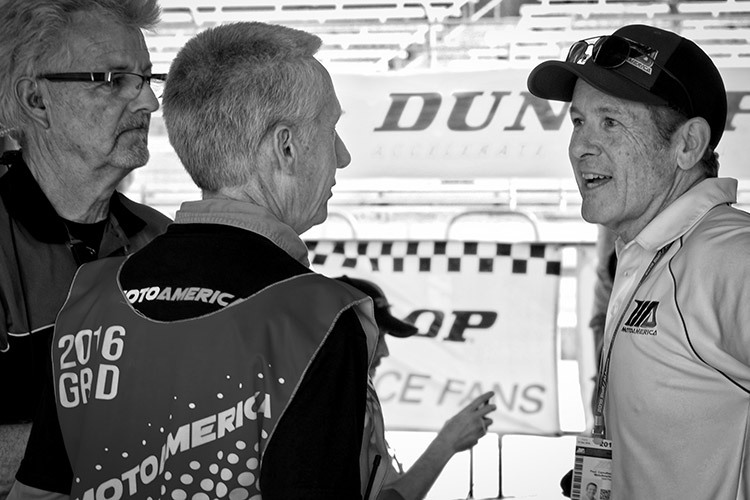 Randy Stem (left), MotoAmerica's Paddock Supervisor, was also race director and operations manager for two national race series for almost 30 years. Bill Syfan (center) is a former superbike racer who worked for Suzuki and Dunlop Tire racing groups and is acting as MotoAmerica's grid marshall. He was a certified FIM Clerk of the Course and served on the board of the Central Motorcycle RoadRacing Association. Paul Carruthers (right), MotoAmerica's Communications Manager, was the highly respected journalist and editor of Cycle News for 30 years, more than 20 years as senior editor (his father, Kel Carruthers was 250cc GP World Champion in 1969, and two-time Isle of Man winner in that class). 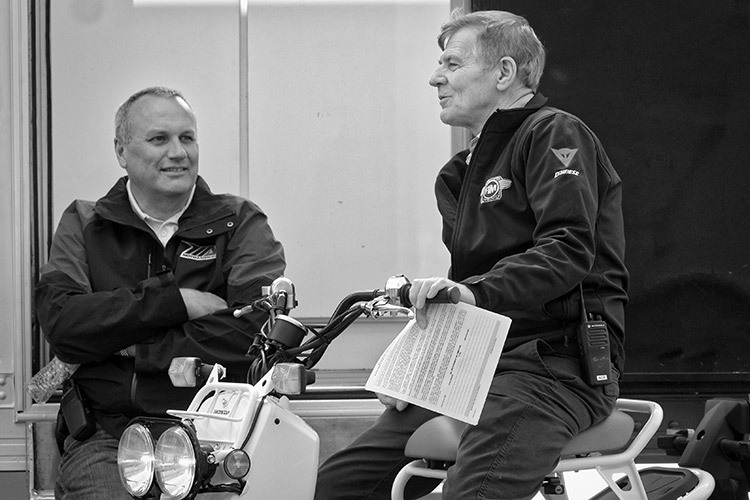 Chuck Aksland (left) and Bill Cumbow (right) discuss a successful start to the 2016 MotoAmerica race season on the first day of preseason testing at Circuit of the Americas in Austin, Texas. Mr. Aksland is a founding partner in the KRAVE Group, LLC, the rights-holders and organizers of the MotoAmerica North American Roadracing Championship Series. He is a former racer and for 20 years was manager for Team Roberts (owned by three-time world 500cc GP champion Kenny Roberts). During his time with Team Roberts he oversaw development of the first American-designed and constructed race bikes for both 500cc GP and first-generation 990cc four-stroke MotoGP classes. Mr. Cumbow (a United Airlines Flight Captain for more than 30 years) is one of six members of the FIM Road Racing Commission Directorship and serves as FIM/AMA Racing Director and liaison with the MotoAmerica series. Without sponsors there is no racing. Each rider, racing team, individual racing event, and the overall series all need their respective sponsors who find value for their business and are willing to invest in the sport. Conor Barr (right) is Sponsorship Manager for MotoAmerica who helps motorsports corporations find the right value for their investment. Mr. Barr has 10 years prior experience as business development manager for both Mazda Raceway Laguna Seca and for Circuit of the Americas. Here, he discusses the 2016 MotoAmerica season with Mark Gandy, Vice President and Director of Products (far left), and Brian Miller, both of Cortech/Helmet House - a major sponsor of the series. Sheila Paul is another member of the MotoAmerica team with deep roots in moto-racing. A life-long rider, she spent several years in amateur roadracing and now competes in flat track. She is an instructor in both the Motorcycle Safety Foundation (street riding) courses and the Texas Tornado Boot Camp - founded by two-time World Superbike Champion and former MotoGP racer, Colin Edwards. 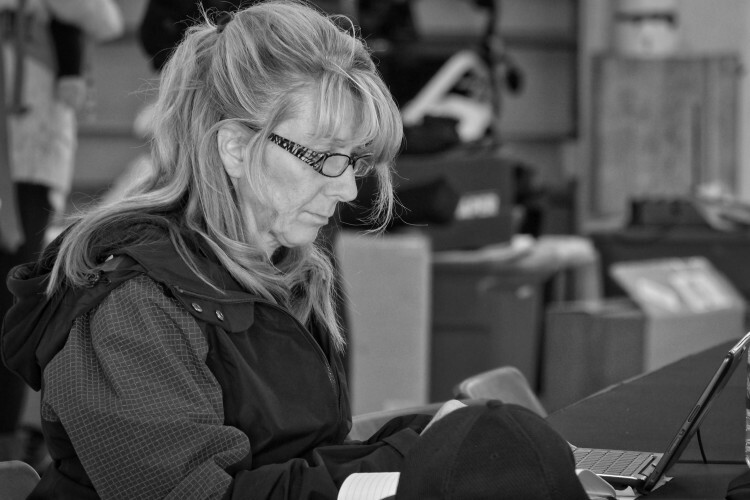 Ms. Paul is responsible for tire control at MotoAmerica events; managing the technical inspection, allocation, and tire control documentation for teams and the tire supplier for each racing class. Like everyone I met on the MotoAmerica staff she provided the friendly help that got me oriented to the paddock and introduced me to other team members who help me get these photos. Pre-dawn to after sunset: MotoAmerica staff and volunteers begin the day before the sun comes up to coordinate logistics between teams, track operators, media, and sponsors. Official activities begin with technical inspections at 7am and last long after the conclusion of each day’s on-track activities. 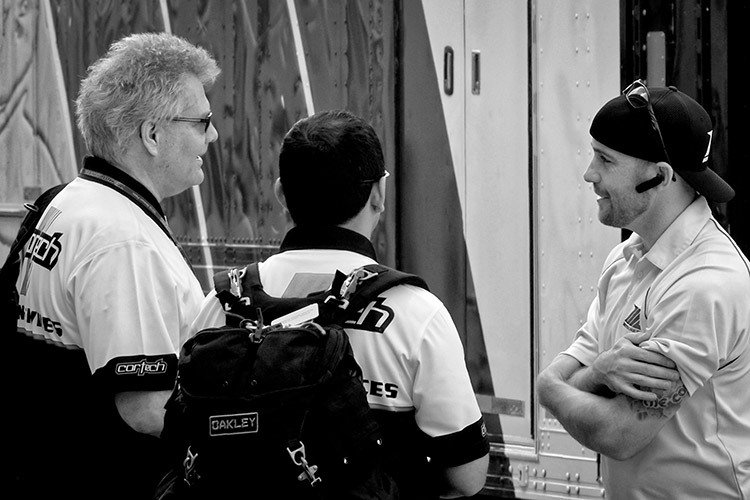 Team members debrief at the end of the first day and prep for the day to follow. 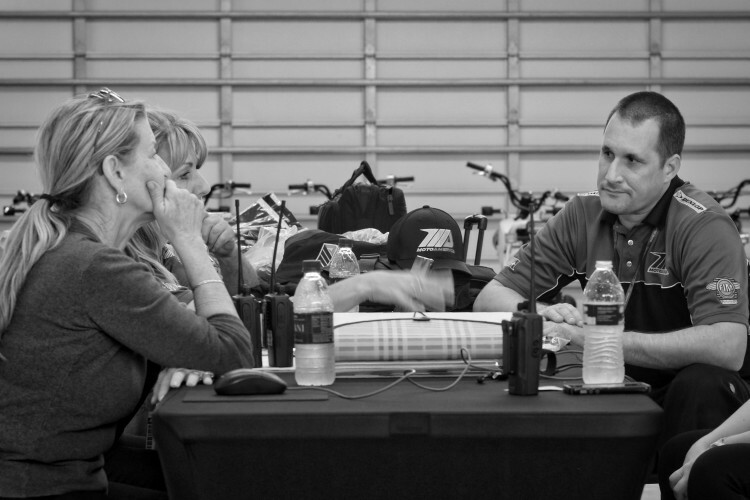 The high level of team communication is evident in how smoothly MotoAmerica events are conducted. Randy Stem, Paddock Supervisor for the MotoAmerica Series, plans for and manages the onsite activities for what is arguably the busiest and most congested area of every race event: the paddock area. Fifty or more teams will compete in a weekend. They span the spectrum from the most experienced professional teams arriving with semi-trucks loaded with equipment (and the riders’ motorhomes), to riders with limited resources who set up shop with a few friends and family, a trailer and a pop-up shelter for a pit garage. Suppliers, including tires (another semi load ), fuel (with its depot), and other sponsors with support facilities, hospitality tents, food vendors, fire and safety, media and broadcast crews… the logistics challenge he manages is mind-boggling. Move-in, racing and decamping all happen in about three-and-half days. The preseason event seemed to go flawlessly - evidence again of MotoAmerica’s professional organization. 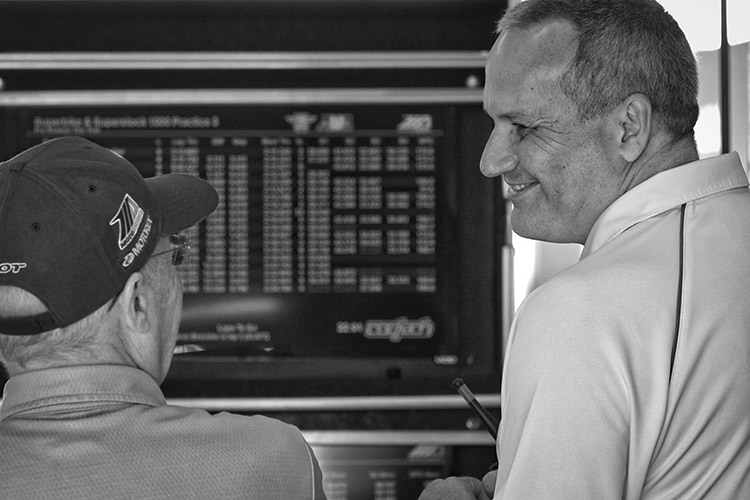 Chuck Aksland visited each team’s pit garage early on the first day of testing to make sure teams and their managers are getting the support they need. Here he is checking in on the Yoshimura Suzuki USA Superbike Team. 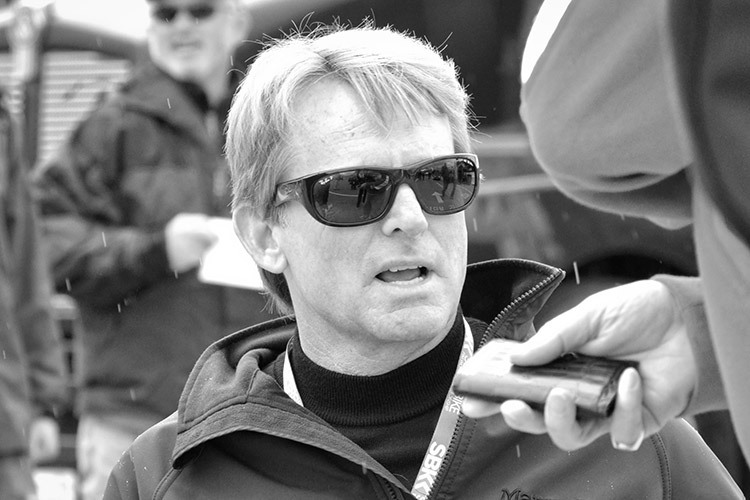 If there is a spiritual leader of the MotoAmerica series it is Wayne Rainey, three-time FIM 500cc GP champion. 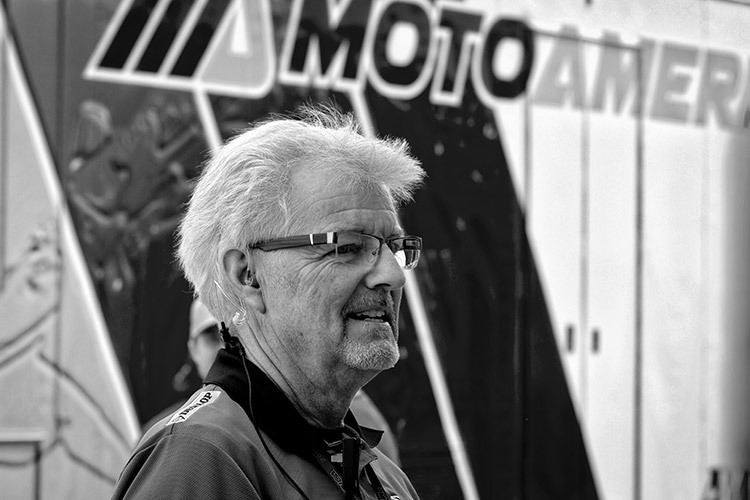 Mr. Rainey is quite likely the only person in the U.S. who has the experience, the personal commitment, and the respect of people in both national and international racing, to build an entirely new organization capable of revitalizing moto-racing in North America. He is one of four partners in the KRAVE Group LLC, created to organize the official FIM/AMA-sanctioned motorcycle roadracing championship in North America. KRAVE is the moniker derived from the founders' last names: Karges (Terry), Rainey (Wayne), Aksland (Chuck) and Varner (Richard). Mr. Karges is also the executive director of the Petersen Automotive Museum and before that was a vice president of Roush Performance. Mr. Varner has been founder and CEO of major energy-sector shipping and transport companies. His passion for motorsports resulted in the creation of Champions Moto (along with Terry Karges), maker of limited edition Triumph-based custom motorcycles. Last day of preseason testing at The Circuit of the Americas in Austin, TX. 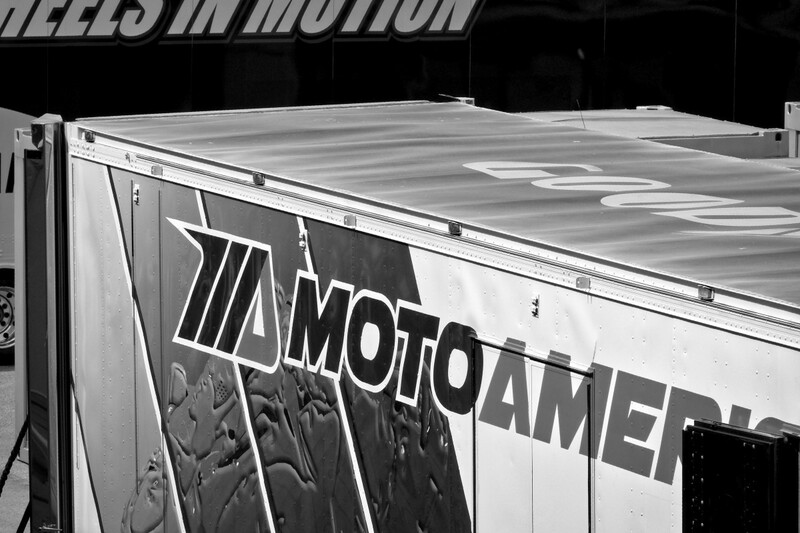 The late afternoon sun grazes the MotoAmerica semi, about to be loaded with the traveling infrastructure of the MotoAmerica series.